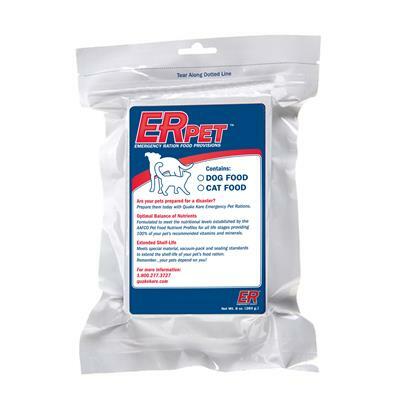 ER™ Cat Food contains 8 ounces of Diamond pet food brand’s Maintenance for Adult Cats Formula that has been specially sealed and packaged to provide an extended shelf-life. Formulated to meet the nutritional levels established by the AAFCO Cat Food Nutrient Profiles for all life stages, ER™ Survival Cat Food provides 100% of a cat's recommended vitamins & minerals for 3 days. Are your cats prepared for a disaster? Stores may be closed for weeks following a disaster and you don't want to waste money and time constantly replacing store bought cat food that you keep in your emergency kit. Many people don't realize that store bought cat food only stores safely 6 months and even less when stored in the heat. Plus, many times pet food attracts bugs and rodents when stored in your emergency kit. So, take this opportunity to prepare your furry feline friend with emergency cat food that will store safelyeven in extreme temperature fluctuations. Dimensions: Single (1): 6.75 x .75 x 9.75"- Case (25): 17.75 x 9.5 x 12.5"
Package material meets te MIL-B-131 Barrier Material Standards. Packages are hermetically sealed using corrosion reistant material. Withstands extreme conditions and temperatures (-22°F to 149°F). ER™ Emergency Ready 72-hour Cat Food Rations have been hermetically vacuum sealed and specifically packaged to guarantee your cat has a fresh source of food in the event of an emergency. Formulated to meet the nutritional levels established by the AAFCO Cat Food Nutrient Profiles, this emergency cat food provides 100% of an adult cat’s daily recommended vitamins and minerals. One re-sealable pouch contains 8 oz. (a 72-hour supply) of Diamond pet food brand’s Maintenance for Adult Cats Formula.